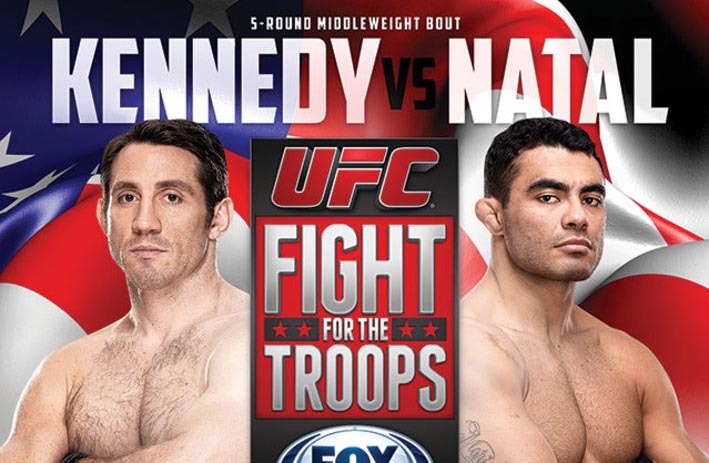 Fort Campbell – US Army veteran Tim Kennedy did not disappoint in front of his fellow service man inside the packed Fort Campbell Hangar in Kentucky when he bagged his first KO of the Night honors after knocking out Rafael Natal in the first round of their headlining bout. Rafael Natal opened the round strong by constantly landing leg kicks to his stalking opponent. Kennedy’s leg has started to show marks from the leg kicks by the middle part of the round. Despite that, the 10 year army veteran continued with his game plan of pressuring his elusive opponent back into the cage. His patience finally paid off in the dying seconds of the first round when he landed a lunging left hook that sent Natal to the canvass. Kennedy followed up with a few strikes to finish him off before Herb Dean steps in to put a halt to the action at 4:40 of the first round. The loss to Kennedy snapped the three fight winning streak of the Brazilian, his record now stands at 17-5, 5-3-1 inside the octagon. Germaine de Randamie withdraws; Strikeforce Challengers 19 now complete with eight bouts. Following Julie Kedzie’s withdrawal from her scheduled bout with Germaine de Randamie (2-2 MMA, 1-1 SF) at the Strikeforce Challengers 19 event, “The Iron Lady” was also scratched off from the fight card. Several sources close to the promotion confirmed that Strikeforce officials were incapable of setting a new opponent for Germaine de Randamie. Strikeforce Challengers 19 will be held this Friday, September 23, at The Pearl at the Palms Casino Resort in Las Vegas. The evening’s main card, which headlines the light-heavyweight bout between Lorenz Larkin (11-0 MMA, 2-0 SF) and Nick Rossborough (18-13 MMA, 0-0 SF), will be aired on Showtime. Prior to the said removal, Gemraine de Randamie has aimed to backfire from her second MMA career misfortune at the Strikeforce Challengers 16 event — where she attained a unanimous decision loss over Julia Budd. With the scratched bout, the Strikeforce Challengers 19 fight card is now complete with eight matches. See the current Strikeforce Challengers 19 fight card after the cut. An undisclosed injury forced Julie Kedzie to withdraw from the upcoming Strikeforce Challengers 19 event in Las Vegas. Strikeforce has just announced that they had taken Julie Kedzie out from the Strikeforce Challengers 19 fight card due to an undisclosed injury. She was supposed to meet Germaine De Randamie on the upcoming event, which will be held on Sept. 23 at The Pearl at The Palms Casino Resort. Their bout was originally set to be included on the night’s preliminary card. Up to now, there are still no reports on Julie Kedzie’s replacement. Before being injured, she participated in the Strikeforce: Fedor vs Henderson card in Chicago wherein she attained a close decision loss to Alexis Davis. Meanwhile, Germaine De Randamie (2-2 MMA, 1-1 SF) aims to come back on the win column after suffering a unanimous decision loss over Julia Budd at the Strikeforce Challengers 16 show. The Strikeforce Challengers 19 event headlines the bout between Lorenz Larkin and Virgil Zwicker. Its main card is expected to air live on Showtime.